The international market requires milk products to meet specified minimum standards that define acceptable composition. This study used a deterministic simulation model to estimate milk products yields of individual cows for different export markets. Four milk product portfolios were analysed which included 100% of the milk to either whole-milk powder (WMP), skim-milk powder, cheese, or butter. Milk product potential was estimated for 4310 mixed-breed heifers from LIC Sire Proving Scheme herds based on total lactation production. Lactation lengths were 212, 214 and 213 days for Holstein Friesian (HF), Holstein Friesian-Jersey crossbreds (HFxJ), and Jerseys (J) respectively. Milk yields were significantly different between breeds averaging 3121 for HF, 2947 for HFxJ, and 2751 litres for J cows. Holstein Friesians had the lowest fat, protein and lactose concentrations, whereas J had the highest. Holstein Friesian had the greatest yields of WMP per 1000 litres of milk, whereas J had the least. For all scenarios, J milk was most valuable per litre. Crossbred cows provided greater total milk income for all scenarios except 100% butter. Positive heterosis effects were estimated for first-cross HFxJ animals for milk production and product yields. 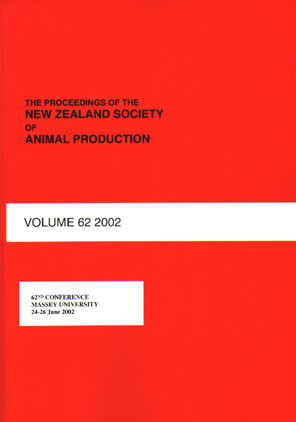 Crossbreeding produces cows with milk better suited to the processing requirements of the New Zealand dairy industry and returning greater value to the New Zealand dairy farmer.